Point-and-figure charts (P&F) is another way to represent the price charts that can be used in Forex trading. Conventional charts display the price as the linear function of time, which results in a demonstrative picture of how the market behaved during certain periods of time. But the problem is that a trader often does not need to know how price changed in time, all he needs is to know is what the prevailing force on the market is at the moment — bulls or bears, demand or supply. That is where P&F charts come handy. They show the price changes graphically, independently on the time during which the changes have occurred. The green X's are the price increases (by some given value) and the red O's are the price decreases. A column of X's represent an uptrend, while the column of O's represents a downtrend. In each particular column, there can be only X's or O's. When one trend ends, a new column starts. As you see, there is no time scale in this chart. Each column can last an indefinite period of time. So, how are these point-and-figure charts drawn? To start drawing a point-and-figure chart, you should first set two important parameter values for the chart — the box size and the reversal distance. 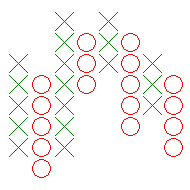 The box size is a height of each of the O's and X's in pips. For example, if you set a box size to 10 pips, each X will mean an upward movement by 10 pips, so a column of 6 X's is an upward movement by 60 pips. The opposite would be correct for the O's. 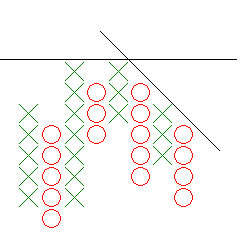 The reversal distance is an amount of boxes that should be passed by a price in a reverse direction for a trend to reverse (to start a new column). The most common reversal distance is 3. It means that on a rising trend (a column of X's) a price has to go down by the amount of pips in three boxes for a new column (this time — of O's) to start. For example, if you use a box size of 10 and a reversal distance of 3: the price goes up by 60 pips, you draw 6 X's, then the price goes down by 30 pips (that is 3×10), you draw 3 O's down, starting a new column from the level below the last X. If the price would go down by less than 30 pips you would not have to draw anything new. Basically, after drawing an X or O you just wait for the price to continue going in the direction for a box size of pips or in a reverse direction for a reversal distance times box size of pips. If we consider a 10 pips box size and a reversal distance of 3 for the image above, then we can say that the price goes up by 50 pips during the first uptrend, then it goes down by about 50 pips, then follows an uptrend for 70 pips, then come two equal bearish and bullish trends for 30 pips (exactly the reversal distance). Then a price declines by 50 pips, then goes up by 30 pips, and finally, falls by 40 pips. It ends at +10 pips (if you sum up all the values) and, as you see on the picture, the ceiling of the final O is 10 pips above the bottom of the first X. That is exactly +10 pips. The effective price is located at the bottoms of the X's and at the tops of the O's. Apart from the chart pattern analysis, P&F charts offer a sort of trading signals. When the trend's direction changes, a new position can be opened in this new direction with a stop-loss equal to the reversal distance. But such trading technique requires some thorough optimization of the box size and the reversal distance for the given currency pair and market conditions. Some traders prefer to use Excel tables to draw P&F charts in a semi-manual mode. It is also possible to use some existing software to draw such charts automatically.